Eight finalists were after their first WSOP bracelet on Wednesday in Event #52, $1,000 No Limit Hold 'Em (w/ rebuys). They survived an original field of 1048 players and two days of intense action to make the final table. Michael Graves, who started the day as chip leader, endured Wednesday's demanding final to take the bracelet and a $742,121 pay day. Thierry Cazals' stay was short, ending when he called Theo Tran's all in. Cazals held pocket tens to Tran's pocket jacks, the board brought no help, and Cazals left in ninth place with $72,599. Pocket tens didn't help Arnold Spee either, who also started his day mid-field. Spee took his up against Isaac Haxton's , but the flop put Haxton out in front. The turn and the river and brought no help, and Spee was eliminated in eighth place, collecting $80,665. Shawn Luman also took pocket tens up against Haxton's A-K, but this time Haxton didn't catch the cards and Luman doubled up. Haxton took another hit from Tran when his K-8 ran into Tran's A-K. Severely crippled, Haxton moved in from the button with , but was called by Chad Batista with . The flop pushed Batista even farther ahead, and the turn and the river were no help to Haxton. He cashed $96,798 for his seventh-place finish. Kris Tate started the day short-stacked and was down to his last 165,000 when he shoved in on . Graves called with pocket fives, and Tran re-raised on . Graves mucked and Tate looked to improve his hand, but a board of was no help. He ended his day with $112,931 for sixth place. Several hands later, Graves woke up with pocket aces. Even better for Graves, Batista found pocket queens and the chips went in. The flop, A-6-4, gave Graves the set and the king on the turn sealed the deal, ending Batista's day. Batista won $129,064 for his fifth-place finish. Shawn Hattem was the next to go. He went in with against Graves' and Luman's . Graves folded, leaving Hattem against Luman's pocket queens. The board didn't help, and Hattem was sent out in fourth place with $161,330. 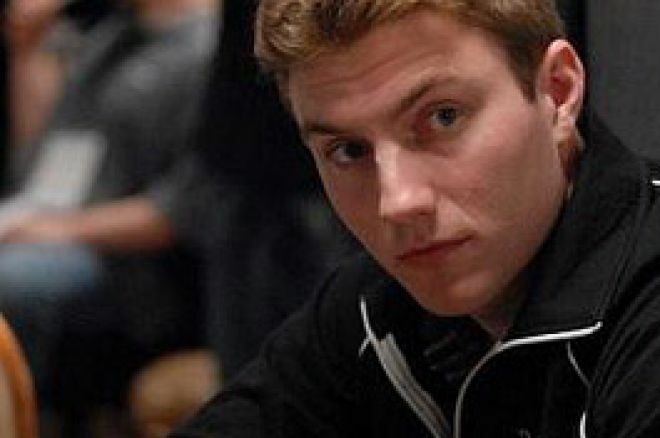 The hand pushed Luman's stack to 2,800,000, giving him the chip lead. Luman's lead didn't last long, though. In the next major hand, Tran limped in with and Luman raised with . A flop of was no help to either player, and Luman checked, but Tran tossed in 350,000. The turn, , saw Luman toss another 400,000 in the pot. Tran tanked, then pushed all in. Backed into a corner, Luman mucked, giving the chip lead back to Tran with the big bluff. Luman then raised another 550,000 with A-9 in a hand with Graves, who then went all in on pocket jacks. After deliberation, Luman decided to fold, after another big pot went to graves, Luman was left with less than a million in chips. Graves then surged, taking a sizable chunk of Tran's chips in the next hand when he made two pair. However, when Graves ended up all-in with against Luman's , it appeared Luman might climb back into the hunt. Graves caught a gutshot straight draw on the flop; the flop changed nothing but the river filled Graves' straight and ended Luman's day. Luman exited in third with winnings of $224,249. Going into heads-up play, Graves took the chip lead with 4,200,000 to Tran's 2,500,000. Tran made early headway before graves surged again. On the final hand, Graves held and Tran when the flop came , giving Graves a pair and an open-ended straight draw. Graves tossed in 350,000 and Tran called off the last of his chips, looking to hit his gutshot and his overs. Neither the turn nor the river helped Tran, giving Graves the title. Tran collected $387,193 for his second-place effort, while Graves took home the bracelet and $742,121.